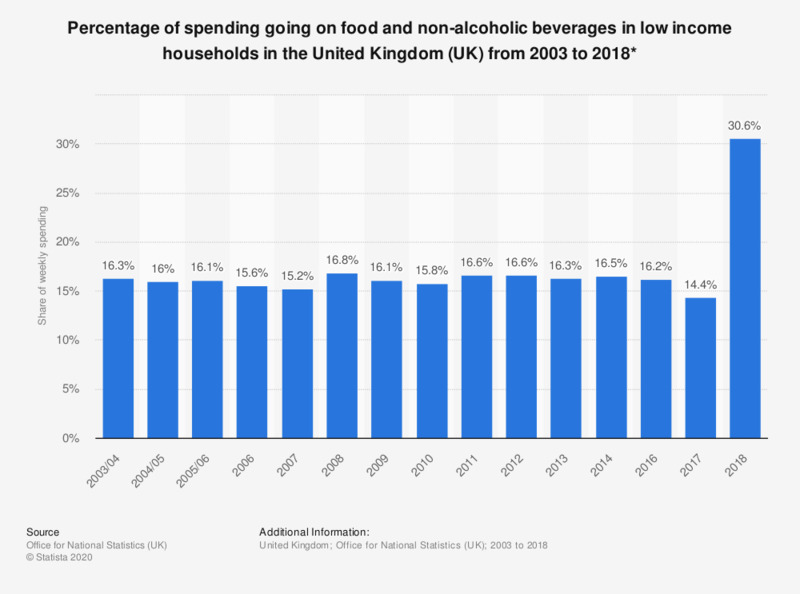 This statistic shows the share of weekly household spending going on food and non-alcoholic beverages among low income households in the United Kingdom from 2003 to 2018. Food spending accounted for 30.6 percent of household spending for the lowest income earning households in 2018. This is the highest spending amount since 2003/04. * This statistic considers the lowest 20 percent of households by equivalized income. Equivalized income is defined by the source as: "The income a household needs to attain a given standard of living will depend on its size and composition. Equivalisation is a means of adjusting a household’s income for size and composition so that the incomes of all households are on a comparable basis." Data for 2015 is unavailable. Statistics on "Frozen food consumption in the UK (Kantar Media TGI)"